Get all the features and benefits of the six ounce at a price less than a new four ounce. 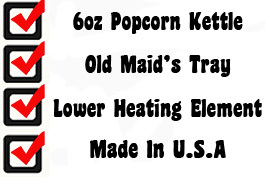 With the standard lower heating element and "Old Maid's Tray", the six will provide an ample supply of popcorn that will stay fresh throughout the day. This feature is found on all machines six and higher. Although the Theater 6 is economical to purchase and operate, it uses the latest technology to insure years of service.